The prohibition against lending on interest (Exodus 22:24) is a well-known biblical law: “If you lend to any one of my people with you who is poor, you shall not be to him as a creditor, and you shall not exact interest from him.” This prohibition was intended to prevent the wealthy from exploiting the unfortunate. In the course of time, it was seen to have consequences that militated against the economic welfare of Jewish society as a whole. As a result, Jewish law (halakhah) has over the centuries relaxed the biblical injunction, allowing interest charges despite the biblical prohibition. Hillel Gamoran seeks to explain how and when this law of high moral standing collapsed and fell over the course of the centuries. Talmudic rabbis believed that business agreements violated the biblical prohibition against lending in five areas: loans of produce, advance payment for the purchase of goods, buying on credit, mortgages, and investments. The Bible does not consider any of these activities, but all arise in postbiblical literature. How was the biblical law to be applied to situations that had not occurred in biblical times? And how could the rabbis allow these activities when they were hampered from doing so by the laws against lending on interest? To answer these questions, Gamoran examines the biblical prohibition against lending and postulates when it was written, why it was written, and to whom it applied. He then considers the early and later teachers of the Oral Law, the Tannaim and Amoraim, who expanded discussion of the ban in light of various business activities from 70 C.E. to 500 C.E. Finally, he explores how the original tannaitic proscriptions for each of the five activities were upheld or relaxed over the centuries. Each activity is considered in the period of the Geonim (ca. 650-1050), the Rishonim (ca. 1000-1500), and the Aharonim (ca. 1500-2000). 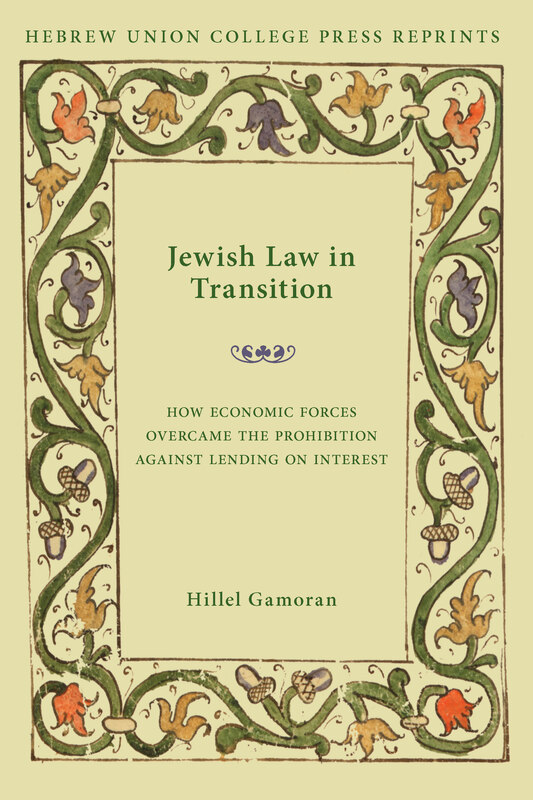 For each period, Gamoran shows how the rabbis struggled with the law and with one another and used inventive interpretation to create the legal fictions necessary for business life to flourish. Hillel Gamoran was ordained at HUC-JIR, New York and received his Ph.D. from Spertus College of Judaica in Chicago. He served as the spiritual leader of Beth Tikvah Congregation, Hoffman Estates, Illinois for thirty-four years. Now retired, he teaches Rabbinic Literature at the University of Washington.